Concrete countertops are being plugged as an eco-friendly option, many even contain recycled glass and are quite beautiful but are they as green as they seem? Concrete is made from cement, most cement is a type called Portland cement. The manufacturing of cement requires a lot of energy, cement plants use several forms of energy, like coal, some use natural gas, and some also burn things like hazardous waste and tires. Cement plants are the 3rd largest emitter of mercury emissions. Mercury isn't the only thing coming out of the stacks at cement plants, they also give off things like sulfur dioxide, dioxins, and more. 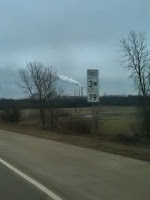 I live just over two miles away from a cement plant that burns tires and other toxic things. They are classified as a high priority violator of the Clean Air Act by the EPA. Yet with many things made of concrete being marketed as green and the plant itself telling everyone it's green, it's an issue that is being overlooked. This cement plant even says it's recycling tires when it burns them for fuel and they say they are committed to environmental issues, they chair the local green committee and are sponsoring a green expo. All while polluting our air at an alarming rate. Many people think I want to shut down the cement plant near me but that's not the case. If the one by me shut down they would have to make more cement somewhere else to meet demand and would just end up polluting another town. Cement can be made in a greener way but many of the cement companies don't want to invest in newer technology or even follow current laws as it cuts into profits. The way the law is now the fines often are smaller than what the company makes from breaking the law. This issue is why when deciding if a product is eco-friendly or not, we must look at the manufacturing as well as the finished product. No product is perfect but we have to try and make informed choices. If you want to see how close you are to a cement plant check out Earthjustice's interactive cement kiln map. 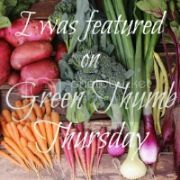 All of the super heroes here at the Green Phone Booth have decided to make a couple of small changes in the way we blog, in hopes of reinvigorating our own writing and encouraging more conversations within our community of green bloggers. We have decided to select a theme for each month, and many of our posts during that time will be related to the theme in some way. Our theme will often be seasonal, and it will always be related to sustainability and something that allows us to write about our passions. We're flexible, though, and won't be writing on theme every single day (how boring would that be?). We want to be able to follow whatever topic happens to inspire us to write. Our first theme will be Spring Cleaning, so expect to read a lot about avoiding toxic cleaning products, making your own cleaners, ideas to organize your home, and anything else related to spring cleaning. Each post about Spring Cleaning will include this cute button. 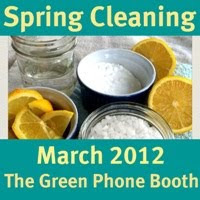 If you are posting about Spring Cleaning, please feel free to use our button, link back to the Green Phone Booth, and share a link to your post with us! But that's not all! After an experimental Wordless Wednesday Linky post a few weeks ago that was pretty popular, we've decided to make it a monthly event! The first Wednesday of each month will be a Wordless Wednesday Linky post. We will try to include a photo that correlates with the theme, and we invite you to do the same on your own blog. But please feel free to link up your Wordless Wednesday post on any topic! Do you have any ideas for future themes? What would you like to read about here at the Green Phone Booth? Please share in the comments! I do a lot of laundry in this house. I have 2 kids in diapers, we play outside and we don't use paper towels. You do the math. I use either soap nuts or homemade detergent for my laundry, so there aren't chemicals swirling around in the basin erasing masking any random odors. And after 2 years of diaper laundry, forgotten loads in the washer and a few falls in the muck while hiking, I felt like our washer had a little case of stink. After some lengthy research online, I discovered that you actually need to clean the washer from time to time. I imagine that as my kids get older and our adventures lead us to muddier pastures, I may need to use this clean up again. Until then, maintaining a washer can help lengthen the life of the machine and keep you from ruined clothes as a result of soap scum building up in your washer drum (trust me, when I say this, there was a horrible disaster involving a sweater that I had only gotten to wear once and I'm still sad over it). Instead of using bleach, I scrub down the washer drum with a paste made from half a cup of baking soda, 5 drops of tea tree oil and 1 teaspoon of Dr. Bronner's liquid castile soap. I add enough water to the paste so that it has a slushy consistency and then hang over the side of the washer into the drum, scrubbing away. Then, I run a quick rinse cycle with a cup of Borax (and the rag from scrubbing) with warm water. After that, the only lingering scent in your washer is well... nothing. And as far as I'm concerned the smell of nothing when I toss my dirty laundry into the washer beats the smell of stink or bleach any day! Well after reading EcoYogini and Kelly's posts on laundry I had to throw in my two cents. See I'm a bit OCD when it comes to laundry, OKAY OKAY, I'm REALLY OCD when it comes to laundry. I like to blame my mom. Most of my laundry habits are very green. I will say the heavy loads with things like towels, bedding and underwear are normally washed on hot, this is only two loads a week and it's better for allergies and germs. I do make sure I wash full loads, I don't over dry the clothes (we have a lot of allergies so line drying doesn't really work), and I use eco-friendly products, this is the main reason I wanted to write this post. EcoYogini said she soapnuts didn't work for her, well that's what I use so I wanted to talk about them. So first off, what are soapnuts? As confusing as this is, they aren't nuts, they are berries. This is good news for those with nut allergies. The berries contain saponins, which is what makes the soap. They are great for HE and front loading washers because they don't create suds. They are also about as natural as it gets and you can get them plastic free. Oh and did I say, they are super cheap per load? A common mistake that is made, when using soapnuts, is they must have hot water to release the saponin. So you can throw them straight in a load if you are using hot water but if you are using cold water they won't work. To use them in cold water you must make a liquid soap out of them. This is quite simple, you boil 4 cups of water, turn off heat, throw in 6-8 soapnuts, cover and leave overnight. 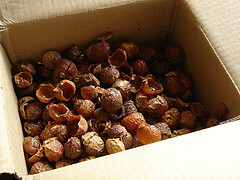 In the morning strain out the soapnuts (and compost them) and store in some container with a lid. If you aren't going to use it in a day or two be sure to store in the fridge as it doesn't have a preservative and can grow mold. Some people freeze theirs in ice cube trays and just throw in an ice cube with each load. You can even add essential oils to the liquid if your want a scented soap. The soap can be used for other things as well. I haven't tried it yet but some people use it as shampoo. You can use it to soak laundry as well. Soapnuts may not be for everyone but they are worth a try. You can get a small sample size package from LaundryTree so there is little risk. So for people that have used soapnuts, what are your thoughts? On the other hand, hype aside, through his site I’ve become aware of a number of fairly intelligent-sounding warnings about issues with conventional medical practices I hadn’t been aware of. One of them came to my attention the other day. Anyone else ever heard of the “Root Canal Coverup”? The basic overview as I understand it: Root canal is the procedure where the dead nerve of a dead tooth is scraped out and then the canal filled with Solid Hard Stuff to keep the dead tissue from infecting the body. A Dr. Weston Price, almost a century ago, advanced this theory whereby there are little “tubules” in the dentin which the root canal procedure does not address, which cannot be sterilized in any lasting way, and which then can become the source of all kinds of chronic or catastrophic illness from MS to kidney disease to heart attack to lupus to who-knows-what-all-else. Price is said to have removed teeth from diseased people, implanted the tooth into rabbits, and the rabbits rapidly developed not only sickness but the same sickness that the person who had had the tooth were afflicted with, while the person who had the tooth extracted saw immediate improvement in their condition. Quackwatch doesn’t think much of Dr. Price either. This isn’t me trying to push or be a proponent of crazy medical ideas; I just prefer to hear different sides of things, keep my mind open to other versions of the truth than the popular mainstream ones. Just because it's mainstream don't make it right. Look at BPA, GMO's, and climate change, for example. So I’m just curious—have any of you run into this set of theories before? What’re your thoughts? As Sustainamom pops in for a visit at the booths, she ponders the eternal perception: "Everyone else is doing it..."
I can almost hear my dad asking, "Will you jump off a bridge if all your friends jump?" Maybe.... If they all live to tell about it! I find inspiration in reading posts by green bloggers. 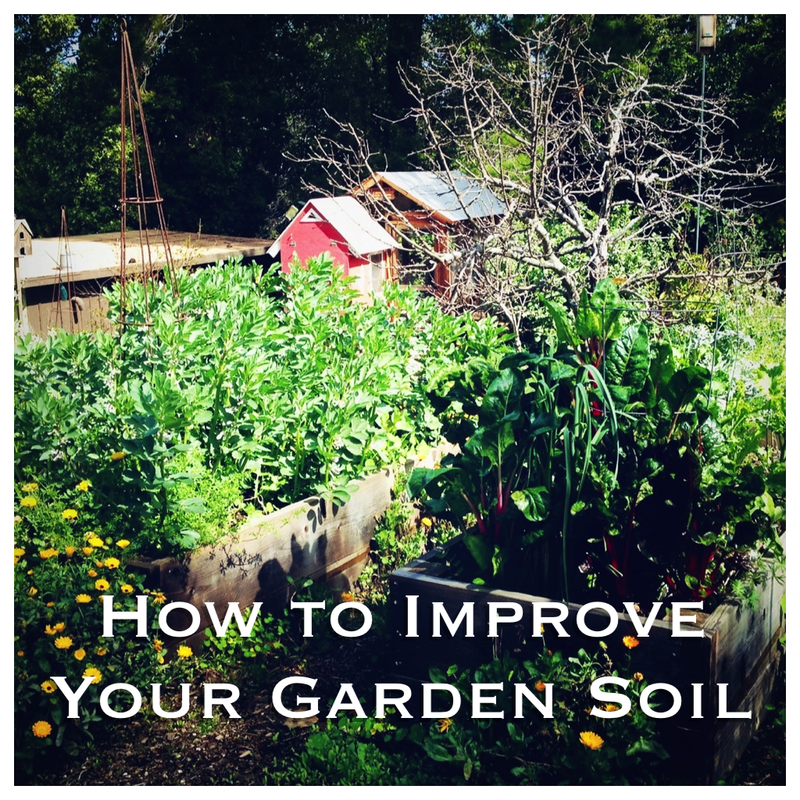 I'm inspired to try everything from gardening to composting. If fellow green bloggers put an idea in my head, it may take a while for me to act on the thought, but I'm grateful for the motivation when I finally do act upon it. And today I want to thank a few bloggers who've inspired me to make my shower more sustainable! Thanks to Beth of My Plastic Free Life and Rebecca of Midnight Maniac, I finally bought a safety razor — and I love it! The word "safety" really bothered me. Somehow it made the razor sound dangerous. So I'd been using my last plastic razor head for the Venus razor I bought several years ago for waaaay too long. It got to the point that it was actually painful to shave with such a dull blade and I knew I had to do something and I really didn't want to spend a fortune on more plastic razor heads. So I finally jumped... and chose a Merkur long handle razor with good reviews and I am so pleased. The shape of the razor makes the blade slide across your skin at the right angle so you don't cut yourself. Even my knobby knees have remained nick-free. The one single blade gives a close shave, and it is so comfortable. Now I just need to decide which type of replacement blades to buy. I like the blades that came with the razor, but they have mixed reviews so I'm wondering if there are even better options out there. Any recommendations? Off what bridges have green bloggers inspired you to jump? What plunge would you like to take next? Link to some inspiring posts to share the motivation! and received no compensation for writing this post. All opinions are my own. Pre-yoga class on Monday, my friends C, H, and I were discussing how often we wash our yoga clothes. I use the 'wear+sweat twice' or 'wear+nosweat thrice' rule (I also use a similar rule of "wear pants/jeans twice if not dirty" rule- shh don't tell anyone!). - We don't have our own laundry (since we live in an apartment) and it piles up during our weekly wash. Laundry was one of those easy eco-changes that can have a nice impact with minimal effort. Since 90% of your washer's energy usage is to heat the water- cold water washes it is! It's been five years of cold water washing and I haven't even noticed the difference. Also we FILL the washer to the max- mostly because it costs money to wash our laundry, but wouldn't ya know that washer's MORE efficient with full loads! Bonus (Ecoholic Home 2009 p.38). What we have experimented a bit with has been laundry detergent. We've tried soap nuts (terrible fail let me tell you) and a few other brands, until I gifted myself with the Ecoholic Home book: it has a handy dandy laundry detergent eco-awesome-effective guide. 1. Bio-Vert (liquid). This rocks as it's a Canadian company, the products are made in Canada (Laval Québec)! The container, although plastic, is made from 33% recycled plastic content, the paper labels are made with 30% post-consumer fibres and are FSC certified... the list goes on. It has worked the best compared to all other 'chemical laden' brands... and it claims to biodegrade in 28 days (where do you think all the soap goes once it drains out of your washer?) with the EcoLogo certifying that it doesn't just biodegrade it smaller toxic components. 2. Seventh Generation Natural 4X (Liquid): Ok, although not Canadian, even before the new fab packaging, this stuff was amazing. The container is made with 66% LESS plastic than a regular container with the outside cardboard uber tree-hugger look from 100% postconsumer recycled fibre. Of course the actual ingredients are extremely environmentally friendly and will do up to 66 loads! (which is double the Bio-vert counterpart). Sadly it was twice the cost (although you could argue it would save money re: double the loads) and it's not made in Canada. Kinda a sticking point for me. However, because the packaging looked so cool I totally bought it and gave it a go. It works amazingly. Of course. Wash your yoga clothes in cold water, avoid fabric softener, hang to dry and you've got yourself an eco-friendly washed yoga gear! When I taught school a few years ago, I felt the need to immediately get out of my work clothes when I got back home each afternoon. After being snuffled and sneezed on, wheedled and wheezed on, I just needed to shed the germs and the stress before I could move on with my day. Unless we had somewhere to go late in the day, I usually just changed into pajamas at 3 or 4 in the afternoon, to avoid dirtying another entire outfit. Still, that created a lot of laundry. Add a cloth-diapered baby to the mix, a baby that we allowed to serve himself table food when he started asking for it around 6 months old, and we had quite a pile to wash every day or two. 1. Rewear pants and pajamas and sweaters and the like more than once. 2. Use a moist washcloth to spot clean obvious problems areas in clothes that don’t need an all-over clean. 3. Air out anything that has a slight smell but isn’t really dirty. 5. Keep a set of dirty playclothes by the back door, and only wash them once a week or so. 7. Hang towels to dry after each use. 8. Wear loungewear that can be worn as daytime attire and pajamas. Well, I totally failed today. I am still wearing the same outfit I put on this morning, but that is not the case with my son. 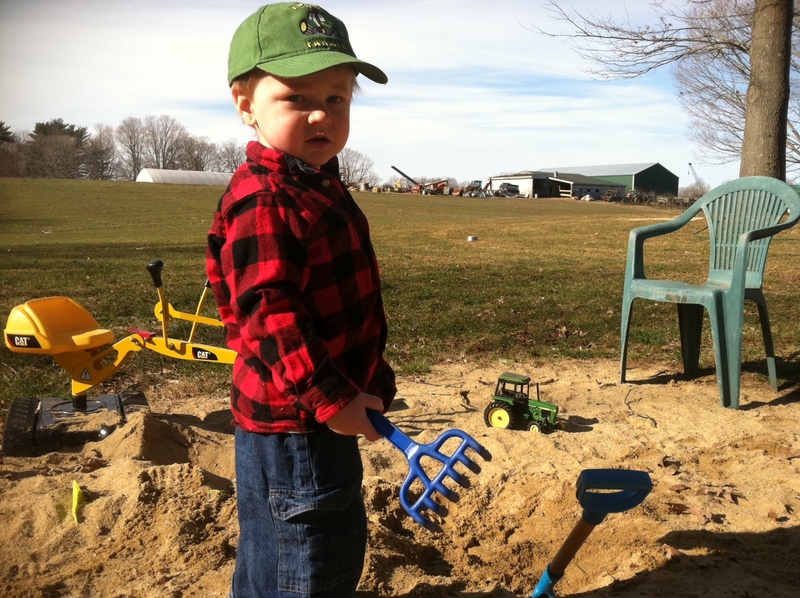 All of these are important little boy experiences that I wouldn’t want to take away for the sake of doing less laundry – especially the mud puddles. But this is an entire load of laundry from today that I can hear spinning in my front-loading washer. Well, maybe tomorrow the Kelly Green Giant will at least remember the diaper at naptime! How do you lighten your laundry load? Please entertain my rant, because I am ticked off beyond belief. According to a recent press release from The Campaign for Safe Cosmetics, lead is still found in many different brands of lipstick. This is something that I first heard about a few years ago, but apparently it’s been common knowledge for at least five years. Why is lead still in lipstick? I’m sorry, have we forgotten that lead is a known neurotoxin? That there are no safe levels of lead exposure for children, and that pregnant women and women of reproductive age should be especially careful to avoid lead? This isn’t BPA in plastic bottles. There is no question, NO DEBATE. There is scientific consensus that people should not be exposed to lead. There are regulations for the amount of lead in gasoline, paint, toys… so WHY is lead in lipstick unregulated? We don’t want children to eat paint chips that may contain lead, but we can have women applying lead to their lips, multiple times a day, consuming the lead with every sip or bite they take, and letting the lead absorb into their skin. I’m seriously frustrated by this, and I don’t even own a single tube of lipstick. Why can’t these cosmetics companies do the right thing? It seems to me that they just don’t care about our health or our children’s health. Go ahead and check out the list of lipsticks that were tested and see what specific companies really don’t care about your health. I was especially disappointed to see Burt’s Bees on the list because it is the only company that I buy from. I’m seriously considering boycotting them, even though I don’t buy their lipstick. I do use their lip balm, shampoo, conditioner and lotion. But which company can I trust? Who can I buy from? I’ve come to the conclusion that I can’t trust any company to care about my health. They only make changes when they are forced by regulations (and even then, change is slow or companies are noncompliant). So why can’t the FDA do the right thing and require that these companies keep lead out of their lipstick? According to the press release from The Campaign for Safe Cosmetics, “The FDA said it is currently evaluating whether to recommend an upper limit for lead in lipstick. The Campaign for Safe Cosmetics is urging FDA to set a maximum limit for lead in lipstick based on the lowest lead levels cosmetic manufacturers can feasibly achieve.” As early as 2007, Senators Kerry, Boxer and Feinstein urged the FDA to begin regulating lead in lipsticks and other cosmetics. Seriously FDA? Stop evaluating and just do it. Why not do something to actually protect human health instead of listening to industry lobbyists? Why don’t women stand up for themselves and demand better? Why don’t men stand up for women’s health while we’re at it? This isn’t about whether you choose to wear lipstick or choose not to wear lipstick. This isn’t an issue just for women, either. This is a human health issue and everyone should be concerned. I can’t help but wonder why a product like PAINT, which is used by all people, is seen as worthy of lead regulation while a product like lipstick, which is seen as only a women’s product, remains unregulated. I choose to opt-out of most cosmetics by either just not wearing them or by making my own, but I don’t think that’s enough. It’s protecting me and my family, but it’s not protecting anyone else. So, what do you think we should do? Contact our representatives? Call for a mass boycott? Jenn the Greenmom gave us her rant about Valentine's Day earlier this month and touched on the issues around many popular gifts, I thought to follow up with that I would share this video, enjoy. Hope everyone has a very happy, ethical, and eco-friendly Valentine's Day! I always figured I lived a fairly green lifestyle given my resources. Reduce, reuse, recycle was ingrained in my practices. I ate locally and organic whenever my budget allowed. I grew my own produce. I eschewed plastic crap in my house whenever I could. What scares me is it isn't enough. There's that little bit inside you that tries to dismiss the worries that the things you use every day could kill you. And you try to tune it out. The reality is chemicals are imbedded in our society, and it's going to take a heck of a lot of effort to get them out. Even if we don't know what the effects of these conveniences are. A few years ago, I read the Body Toxic, and it scared the crap out of me. That book chronicled the history of hidden chemicals, almost as a government conspiracy. (Who knows? Perhaps it is.) There, I learned to fear PVC shower curtains and microwave popcorn. Fun stuff. The problem is, while there's much you can do to educate yourself on chemicals imbedded in our everyday things and the possible effects, hunting down alternatives is tough business. That's why I looked forward to reading "The Non-toxic Avenger: What you don't know can hurt you" by Crunchy Chicken's Deanna Duke. If anyone could find an alternative, I figured, she could. No, Duke doesn't find all the answers. She's still on the hunt for mold-cleaning products, for example. But I love the fact she's still looking and willing to share what's she's found as the best possible alternatives. "It's still an uphill, daily battle trying to determine whether a product I pick up at the store will poison me," she writes. At least we have a new, consolidated resources to help us in this battle. I came away, whether Duke intended or not, with a guide that could sit on my shelf - one that I could point to in order to help me more quickly find solutions to my quests. In my continuing self-education about supporting our health, activated charcoal kept popping up. I added it to my mental list of things to get for my ever-evolving "home pharmacy." After my sister suffered through 36 hours of, um, episodes following a meal with some now-suspect coleslaw, I decided I needed to have that charcoal on hand sooner rather than later, just in case a situation hit in my own household. On Monday, I walked to the chain-store pharmacy near my office, wallet in hand. I went to the counter, and explained for what I was looking. The aide remembered that she'd seen some charcoal in an over-the-counter aisle, but that it might have had its formulation changed. She strode expertly right over to the aisle location, plucked off a box, and... confirmed the change. She then turned me over the pharmacist for further help. He padded back to his computer, typed away, and came back to let me know that his supplier had charcoal tablets. He could order them and have them for me the next afternoon. Great, I said. Tuesday afternoon, I walked expectantly back to the pharmacy. The pharmacist remembered me, and had a little box waiting. He handed it to me for my inspection. I went right to the ingredient list. Oh! In fact, it WAS a list. This wasn't just charcoal... it had some homeopathic remedies mixed in. I tried to overlook that fact, and my finger continued tracing along the back of the carton... FD&C this, and FD&C that... (Why the heck would I want fake colors in a black product whose job was to go into the gut, do its thing, and then pass back out?) I looked up at the pharmacist, who sensed that I wasn't liking where this was going. He quickly assured me that I didn't have to buy it. He would have no problem sending it back to the warehouse. Especially since he had gone through the trouble of ordering this just for me, I really wanted to like this product and to buy it from him. That nagging gut (pardon me!) feeling told me otherwise. Stoically, I kept reading... propylene glycol... proplylene glycol?! Are you kidding me? Now, we had a deal-breaker. What part of just-activated-charcoal-please was not getting through? Was it really that hard to find a single-ingredient item? With the confidence from my internal nagger, I looked back at the pharmacist, who kindly reassured me that sending the product back was no problem. Very well, I told him. Please do return it. I then thanked him effusively for his help, and headed back to work. My non-internet options are not exhausted -- there are two other stores which I'm quite certain will have a product for me. It's a drive, not a walk, to get there, but I can chain the trip there with other things. I'm enthusiastic about the power of such a simple remedy. I'm far less enthused about the challenge of trying to find it in its pure form. My 5-day-old baby in a fitted cloth diaper. Eco-novice urges you to consider cloth. Even if you use disposables for the remainder of your child's diapering months, I would encourage anyone who is even remotely interested in cloth diapering to consider using cloth for the first six months of your baby's life. 1. If you are a bit concerned about all the toxic chemicals in your child's world, then both the known ingredients and the undisclosed ingredients (such as the components of the fragrance) of disposable diapers will give you pause. If you are going to pay attention to the ingredients in any product, it might as well be the product that comes in contact with your baby's private parts all day long. During this newborn period, your baby is extremely vulnerable to endocrine disruptors and other harmful chemicals. In addition to being more sensitive, newborn skin is also more permeable than the skin of older children and adults. Chemicals in diaper wipes, disposable diapers, and personal products can easily pass through your infant's skin into her body, so this is the time to be super-conscientious about ingredients. 2. Cloth wipes are better at getting off that yellow runny poop than disposable wipes. Also, the ingredients in disposable wipes are weird. 3. Cloth diapers prevent pooplosions! And, as many parents know, newborns are prone to poopy explosions because of their runny poops. I am now cloth diapering my third child and I have never had cloth diaper leak poop. 4. You don't have to do a darn thing about the poop. Dealing with poop is one of the big reasons that folks steer clear of cloth diapers. But if you breastfeed, newborn poop is completely water soluble and washes right out in the wash. You toss the poopy diaper in the wash and you're done. The diapers will stain, but personally I don't care about that (line drying helps with that, if you do care). 5. Young babies stay put. There is a small learning curve to using cloth diapers, especially if you are accustomed to using disposables, and it's easier to become a whiz at using cloth diapers with a newborn than with a squirmy 9-month old or toddler. 6. Newborn babies go through a lot of diapers. I change my 2-month-old baby about 8 times during the day, I'd say. If you change your baby's disposable diaper in the middle of the night, you may go through even more diapers. Let's assume 6 diapers per day for the first six months (I'm trying to estimate conservatively here -- feel free to argue with my calculations in the comments). That's almost 200 diapers per month! Let's estimate that you spend $40 a month on diapers, night time diapers, and wipes. (If you choose to buy "greener" brands of disposables, you will spend significantly more.) As long as you spend less than $240 on cloth diapers for the 0-to-6-months period (and you can spend far less than that if you choose a less expensive system, buy used, or make your own) you will come out ahead financially. Plus you've kept hundreds of diapers out of the landfill. I'm not going to argue about the environmental impact of cloth versus disposable diapers here, but there is no doubt that cloth diapering exposes your child to fewer potentially toxic chemicals during a very susceptible period. Add to that the fact that the first six months are in many ways the easiest and most economical time to cloth diaper, and I think we have a pretty good argument for cloth diapering your newborn. How much do you spend on diapering supplies each month? Have you considered using cloth diapers? Remember back when the rest of the Boothers and I shared our Eco-resolutions for 2012? It was my goal to actually get my act together and bring my reusable bags to the grocery store. I don't go to many places when I grocery shop. Kroger, the butcher and a local country market. I always remember to take my insulated bags to the butcher shop. Even now, when it's cold out, I like to have my own bag with me because I can really stuff it full and even just toss it into the fridge when I get home knowing everything is contained. I had realized that if I was going to make the other stores and the bags work, I might just have to do it without extensive lists for the sale flyers at Kroger and probably also not bring the kids along. For the record, I've only been successful about half of the time. What's been a bigger realization for me in the last month, however, is that the sale flyers and coupons aren't really working for me. I used to watch the couponing show on TLC and even got to attend a how-to for coupons a few months ago. I left feeling very inspired and had high hopes of saving all sorts of money. But as I clipped the coupons faithfully every Sunday afternoon, I realized that I was throwing away 80% of them because they don't work with the Real Food guidelines. I know how to make croissants for the weekend breakfasts, so I don't have a use for any of the Pillsbury coupons. I make my own beef stock so the Swanson coupons are also pointless for me. Little by little, I realized that I really don't benefit from the coupon clipping. Sure, it's nice to save the money on things like garbage bags and toilet paper, but I'll never have a stockpile of products in my basement that weren't canned by me. But really, it's ok. I don't need to have a stock pile of salad dressings that have a shelf life of years waiting for me to rotate through them. I can whip up a quick dressing in less time than it takes me change a diaper. Switching to Real Food takes some effort, but it's not without reward. I'm not spending hours clipping and scoping for deals. Instead, I've found bread recipes I love. I didn't waste the chicken bones and made stock. It's amusing to me that a few short months ago, I was all set to save money by using brand name items until I realized that I can save money just by continuing what I've been doing for years. Even though I have yet to find a coupon for farm-fresh lettuce or 50 pounds of flour, I do sometimes purchase naturally branded food products. 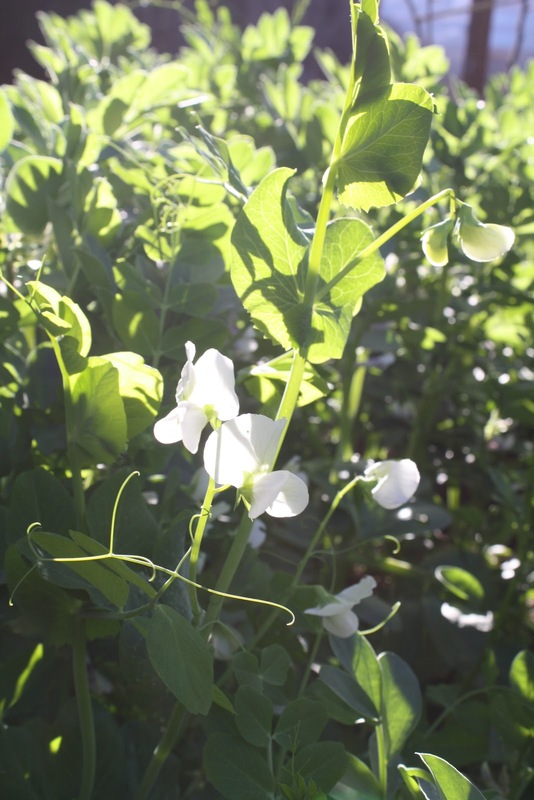 And when I'm looking for those specific products from the natural product lines, I always scope out Organic Deals. If you are looking at a Gluten Free diet or want to buy specific organic products, this site is wonderful. These days, my coupon box has coupons for Traditional Medicinals teas and free day passes to take friends with me to the local children's museum. I keep my eyes open for deals in the grocery and I'm wise about what I purchase at the grocery versus at the bulk food store, but I rarely use a manufacturer's coupon. I guess I don't really need those 40 cents off on Rotel tomatoes... there are still 4 dozen pints of my own canned diced tomatoes waiting for me to use them before this year's tomato harvest! Today has been crazy and right now I'm trying to get dinner on the table so for my post today I'm going to share a video/recipe from EcoRico, an eco-friendly cooking show on YouTube. I have not made this recipe but I've made Arroz con Pollo before and it's quite good and this one looks even better. If you enjoyed this episode be sure to check out more of EcoRico. Whereas EcoYogini watches herself transform into a tree-thumping friend... over soap. I have always prided myself in not being one of "those" tree-huggers. Ya know- the preachy kind. Oh I can pontificate all I want on my blog, but IRL I believe that my friends (and family) are intelligent people that will make decisions that work best for them. EcoY & C. stepping into a Lawton's one Saturday afternoon. C- "I need more handsoap refills- come help me choose something yummy smelling!" Moments of us smelling and rating the scents of various pump soap refills, all synthetic and filled with chemicals. EcoY "They smell pretty good considering..."
EcoY: "Well... it's just there's those little plastic-y bits in the soap. They're called nurdles". C-"Wtf? Nurdles? But I thought they were just bits of soap... they're plastic?" EcoY: "Yep, and they go down your drain, don't get disolved by our water systems and flow into the oceans for fish to swallow. The fish swallow the plastic bits. It's really terrible actually." Nurdles are tiny bits of plastic that float around in the ocean. Sadly, our ocean is filled with these bits, from plastic that slowly breaks down into smaller parts (but does NOT decompose or disappear) or from things like the little balls present in handsoap or body wash. The "micro exfoliation beads". These soap and body wash beads are made of plastic. Therefore, they don't dissolve in water. Instead they go down your drain, through your sceptic system (or municipal/city water treatment system) and spew forth into your rivers and ocean. To swim merrily on their plastic way until a fish eats them. According to research cited by Alan Weisman's "The World Without Us", all sea organisms able will swallow plastic nurdles (p.146). If they lodged in the intestines of the organism the result was terminal. Other times they passed through. The point of concern was that plastic and how it bioaccumulates in living organisms hasn't been studied well enough as plastic hasn't been around long enough. One thing that was clear: soon we'll all be ingesting these plastic nurdles, from zooplankton all the way up to humans. Surround those nurdles with synthetic chemical ingredients wrapped in more plastic and you've got bodywash and pump soap. Sadly, I was addicted to both pump soap (because I thought men would NEVER use a bar to wash their hands... my brother and dad were always pump soap guys) and body wash (because it smelled so pretty). Then I discovered Birch Bark Soap. (Actually, I just needed to discover yummy smelling, locally made soap). Sherrie at Birch Bark Soap, uses only natural essential oils, olive oil (no palm oil!) and her soap smells amazing, lathers beautifully and doesn't leave a residue. We order in bulk so that the soap is cheaper AND we place our soap in a jam jar with small ocean shore pebbles leftover from our wedding ceremony (long story). This way our soap lasts weeks per bar. Soap ends that get tricky to lather or handle go in the kitchen and become our "kitchen soap". And wouldn't you know, Andrew's mother taught him to wash his hands with whatever soap was available. So no pump soap does not equal no washed hands. (Ok, my brother and dad aren't disgusting, but they seem to have their quirks). If you're a pumpsoap/body wash kinda person, just know that making the switch to bar soap is totally doable, relatively inexpensive and can have equally yummy smelling results! 1. Which vendor at the farmer's market is running a special on no-spray blueberries. 2. Who has an extra potty seat that they are giving away. 4. When my local used children's clothing store is having a big sale. 5. Who has a great homemade holiday gift idea. The Kelly Green Giant wants to know - how does Facebook strengthen your green community? Wordless Wednesday - No Coat Required - With Linky! It has been incredibly warm for winter in Connecticut! We've been soaking it up, so there's no time to write a post. Please link up your Wordless Wednesday if you have one on your own blog!